Sanju Box Office: Sanju, by bagging in 333.55 crores in its bag, has stepped a level above in the list of most profitable films of 2018. The movie made on a budget of 80 crores have earned sky-high to obtain a reputable position in the list. Starring Ranbir Kapoor as Sanju, the movie has turned out to be a magnanimous affair for the production house as well as distributors. The list of most profitable films of 2018 is still dominated by Kartik Aaryan, Sunny Singh & Nushrat Bharucha’s Sonu Ke Titu Ki Sweety. Released earlier this year the movie earned around 108.46 crores & was produced at the controlled cost of a mere 24 crores. Its return on investment stands at 352.95%. 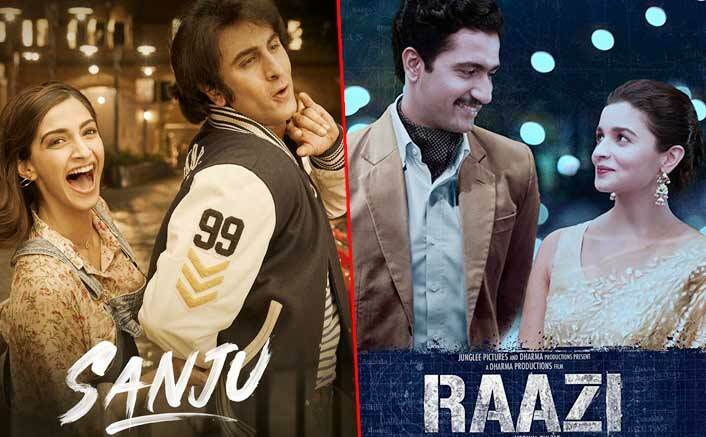 Sanju has taken the 2nd position in the list surpassing Alia Bhatt’s hit film Raazi. Raazi was made on the cost of 30 crores and earned around 123.17 crores which took its return on investment at a mighty 310.50 %. Sanju has earned a total of monumental 333.55 at the box office till now & if we calculate its return on investment by the formula mentioned above, it stands at 316.93%. The movie still has a couple of weeks run left at the box office to juice up as much as it can. It would be interesting to see if it can surpass Sonu Ke Titu Ki Sweety in the list. Vijay Singh Exclusive Interview: Will Sanju Become The Highest Grosser Ever; Here’s What He Thinks! Historic Success Of Sanju, Padmaavat & Baahubali 2 On Non-Holiday Proves THIS! Sanju brings to fore the life and times of Bollywood’s controversial actor Sanjay Dutt. His bond with his father Sunil Dutt, his many romantic affairs, brushes with the underworld, addictions and his prison time among other things have all found their way in the film. Sanju is also the biggest opener of Ranbir’s career. Besharam (2013) made an opening collection of Rs 21.56 crore and was his best opening day number-spinner till date. The post Sanju Box Office: Surpasses This Major Movie In The List Of Most Profitable Films Of 2018! appeared first on Koimoi. Luka Chuppi Box Office: Already The THIRD Most Profitable Movie Of 2019!